Look at these. Not very impressive, are they? Just some flat pieces of baked clay, about 30cm (12”) or so across, sort of wavy in the middle and surrounded by a pronounced rim. Not too interesting, probably some random objects from among the many thousand unidentifiable pottery artefacts that are found at excavations across the Mediterranean and beyond year-in, year-out. Not quite. 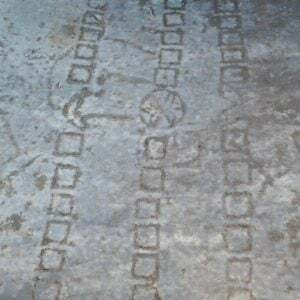 These objects, found at the very famous site of Olympia – the great sanctuary of Zeus in the Peloponnese that was the home of the original Olympic Games – are rather important. They are among the very few pieces of evidence that survive from one of antiquity’s most celebrated works of art, by one of history’s most celebrated artists: the statue of Zeus at Olympia by Pheidias, considered one of the Seven Wonders of the Ancient World. 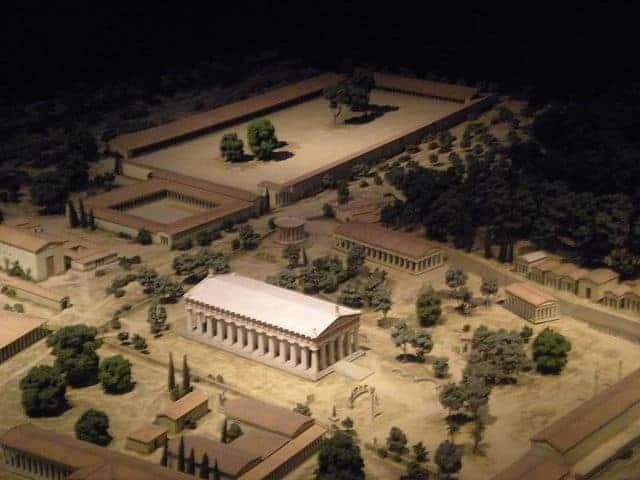 A model of the central area of the great sanctuary of Zeus at Olympia (part of an exhibit in the British Museum a few years ago). The vast Temple of Zeus dominates the site; the workshop of Pheidias is visible on the left edge of the image. In the 5th century BC, Olympia was one of the most revered sacred places in all of the Greek World. Although it belonged to the state of Elis, it was considered “panhellenic” (“all-Greek”), a place of great sanctity to all Greeks, whether they lived in mainland Greece, in the islands, in Anatolia, in Sicily, in Italy, in northern Africa, or further afield. Every four years, thousands of people descended upon the site to partake in or to watch the Olympic Games, an athletic event held in the honour of Zeus and a major occasion for the hundreds of city-states that made up the Greek World to compete, and thus to meet. Olympia had been provided with a monumental temple to Zeus, constructed from 472 to 456 BC – this was one of the most striking architectural expressions of Greekness at its time, and probably one of the most influential as well, as it would be seen by all visitors to the Games. 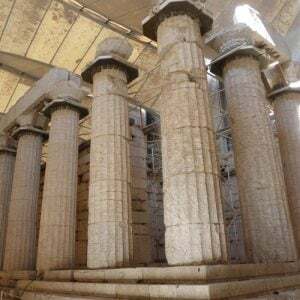 A generation later,n around 435 BC, the city-state of Athens, then at the height of its wealth, power and influence, decided to donate an appropriate statue of the Father of the Gods to be placed in the Temple. Of course, that statue was to be monumental and chryselephantine. 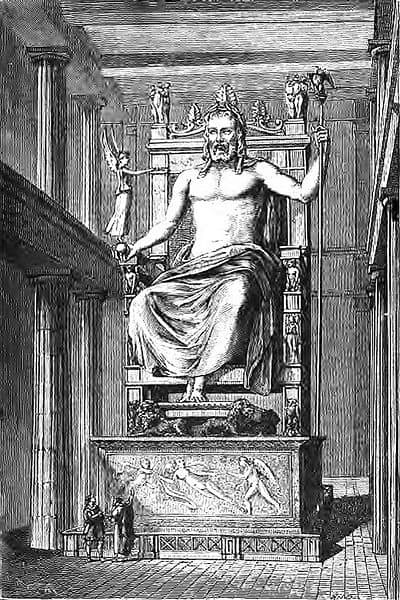 A 19th century engraving of what the statue of Zeus may have looked like, based on the description by Pausanias. 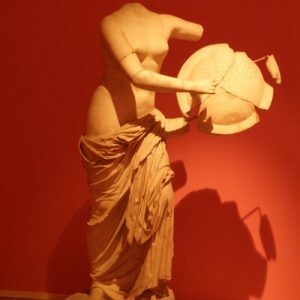 Its sculptor was Pheidias (sometimes spelt “Phidias”), an Athenian and close associate of Pericles, the most powerful Athenian politician of his age. Pheidias was also responsible for the re-design of the Athenian Acropolis, and for the likewise gold-and-ivory statue of Athena within the Parthenon, as well as for that building’s celebrated sculptural decoration. In other words, he was the most prominent artist of his time. In Olympia, he designed a 13m (43ft) tall statue of the enthroned Zeus to be placed in the temple. Pheidias had a special building constructed as his workshop, in a prominent position not far from the temple of Zeus itself, its dimensions identical to the temple’s cella or inner sanctum, so as to replicate the spatial conditions (also the lighting) that his work would be placed in. The statue itself was supported by an internal framework of wood or metal, its externally visible parts, i.e. what the visitor would actually see, being essentially a cladding made of sheets of gold for the god’s clothing, hair etc, and ivory for his flesh. The statue must have been spectacular: its was praised throughout antiquity, legend had it that Zeus himself showed his approval by striking the temple with lightning without causing damage, and it was often copied, and also depicted on coins struck at Olympia. When the sages of Alexandria decided on their list of Seven Wonders, they chose it as one of them, over the equally spectacular Athena at Athens, perhaps for political reasons. 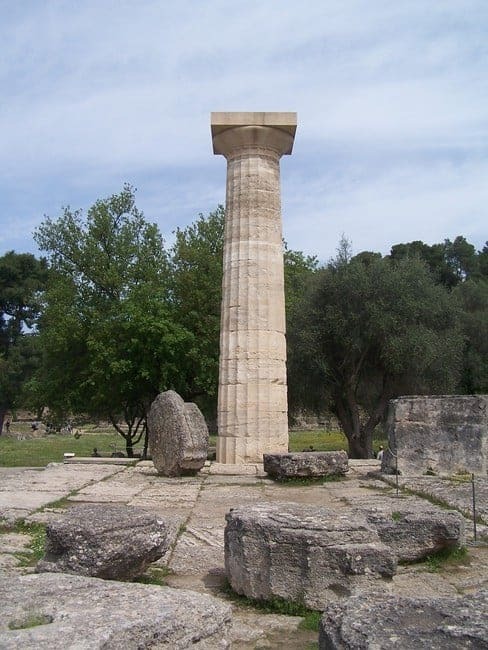 The ruin of the once mighty Temple of Zeus, with one re-erected column. There is nothing left of it. Although we cannot be sure, it is likely that the statue was carried off to Constantinople, the successor of Rome, in the 4th century AD and perished there at some later stage, perhaps during the sack of that city in the course of the 4th Crusade in AD 1204. We can’t be sure what happened, but the loss is equal to a disappearance of the Sistine Chapel, Van Gogh’s Starry Night or Michelangelo’s David. A major and hugely influential piece of human achievement that impressed and inspired people for a thousand years or more is lost. – but not totally. The (German) archaeologists who excavated Olympia from the late 19th century onwards were not surprised to find no trace of the great chryselephantine statue within the remains of the temple, which was probably destroyed by an earthquake around the 6th century AD. 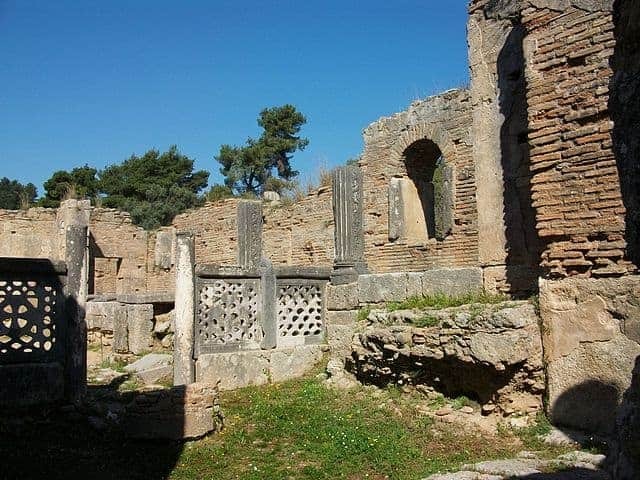 The excavations, guided in part by the remarkably accurate description of the sanctuary that the 2nd century AD travel writer Pausanias has provided us with, also revealed the “Workshop of Pheidias”, the building within which the statue had been designed and made. When Pausanias visited Olympia, about 600 years after Pheidias had worked there, it was still used as a worskhop, dedicated to the maintenance of the great statue. The initial excavations in the 1870s and 1880s revealed a structure clearly of 5th century BC date, of nearly the exact dimensions as the great temple’s cella, but later reused and modified as an Early Christian church. The interior of the Workshop of Pheidias, where the moulds were found. The limestone foundations belong to the original 5th century BC structure, the brick walls and internal fittings to the 5th century (?) AD church. (Image by Wikimedia Commons user Joanbanjo). Renewed digging in the mid-20th century revealed several caches of objects related to the building’s initial use, and thus to the great statue of Zeus. They included many chips of ivory and other precious materials, a (very controversial) drinking cup inscribed with the line “I belong to Pheidias” and the moulds shown here. That’s what they are. They are clay moulds, very carefully made and almost certainly used for hammering the gold garments of the god in the repoussé technique. 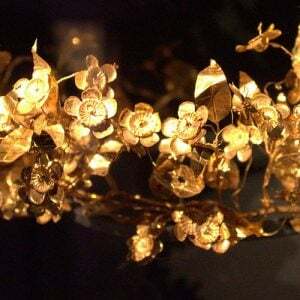 In all likelihood, they were stored and maintained carefully for centuries, as gold is likely to be stolen in case of conquest or sold at times of hardship, but can be replaced during better times. The most famous statue of antiquity (or one of them, there are other contenders) is gone forever, and may well be beyond our imagination. But there is hands-on evidence for its existence and for some of its detail. That’s how archaeology works at times: we find seemingly unassuming objects that open up direct access to stories and ideas that are awesome in the true sense of that overused word. 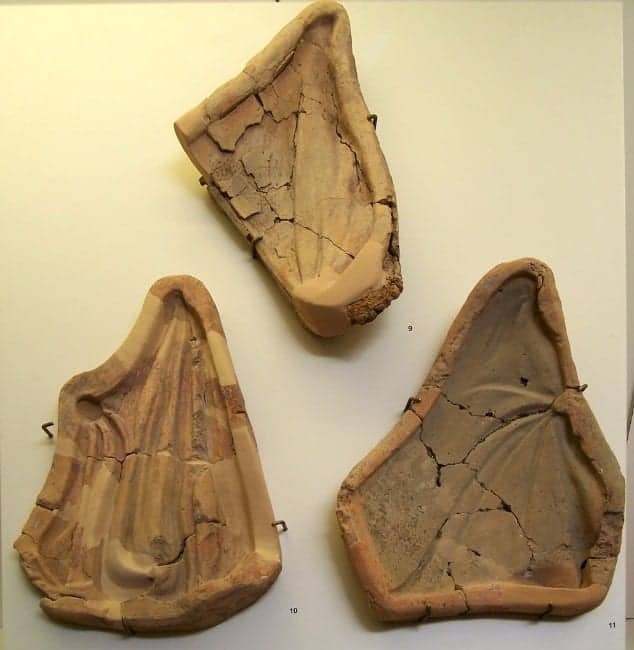 You can see these clay moulds and much more when visiting the museum of Olympia on our Exploring the Peloponnese tour, where Olympia is just one of many highlights in one of Europe’s historical and mythical heartlands.